battlegrounds_games has no other items for sale. *$63 for 24 months. Minimum purchase required. 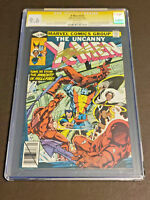 X-Men #121 -MINT- CGC 9.8 NM/MT - Marvel 1979 - 1st App of Alpha Flight!!! X-MEN #129 CGC 9.6 WHITE PAGES 1st KITTY PRYDE EMMA FROST UK Variant U. K.